Few rural settings surpass the perfect grouping of All Saints’ Church, standing beside the centuries-old farmhouse, and church hall, on the green hillside overlooking the brook with its chattering ducks. “Profound peace reigns here; it is a very spiritual place.” Many in need of God’s support and consolation echo the words of author and local historian Michael McGarvie. Footpaths and the farm road, from all four points of the compass, have their focal point at the church sheltered by its ancient yew trees. The paths must have been walked for many generations as there has been a place of worship at Rodden since the early 13th Century at least. Above its welcoming entrance is the date 1640, when it was restored, but diligent research by John Day, when Church Warden, traced a Medieval chapel back to 1200. Today, we still draw visitors to join our congregation as they enjoy our services from the traditional 1662 Book of Common Prayer (BCP). Seating 100 comfortably, with its overhead electric heating and audio loop system; “Dignity goes hand in hand with warmth and practicality. A quintessential English charm is found here,” wrote Michael McGarvie in the foreword to John K Day’s book entitled Rodden Church, Frome. Copies are available in the church. 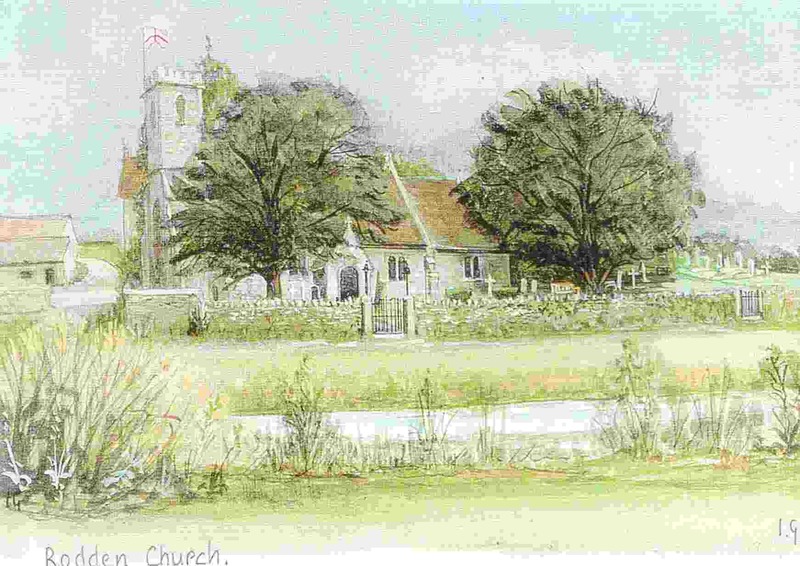 Being part of the Benefice centred on Beckington, All Saints has a regular pattern of services over four Sundays. The congregation park their cars in the farm’s cattle yard, with the permission of the farmer Dennis Pattinson, an Emeritus Church Warden. The fifth Sunday provides a Benefice service, at 10.30 am, rotating between the five churches. Special services of BCP Holy Communion are held at Rodden on Ash Wednesday and Maundy Thursday. On Easter Sunday the time for Holy Communion is 11am.. Harvest is celebrated on the first Sunday in October. Rodden Parish, along with Orchardleigh and Lullington Parishes, is a member of the Prayer Book Society. Details of the church officers and how to make contact are given in the Network magazine which is displayed on this website. Please come and introduce yourselves, you will receive a warm greeting from everyone.. Please take a look at our forthcoming events and join us as often as you can. You can see the map and the area covered by this Parish here and contact us here.